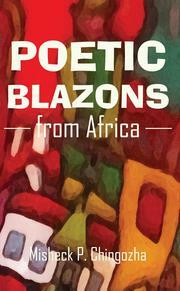 Poetic Blazons from Africa is an effort by the poet to bring into life the feelings and thoughts of a voice in agony. This effort takes the reader through pain that seems to come with every step that individual takes. The poet seems in tears as he traverses the rigours that characterize his terrain. Joy and happiness appear just remote though there are a fleeting moments of hope. The poet seems so drowned in choking pain that he appears to have failed to eliminate from childhood to the extent that at times he talks about his last lap as though he has already resigned on the purpose of living. His heart seems to have been jilted and he will not love again. Or would he?